Your pattern looks fantastic. 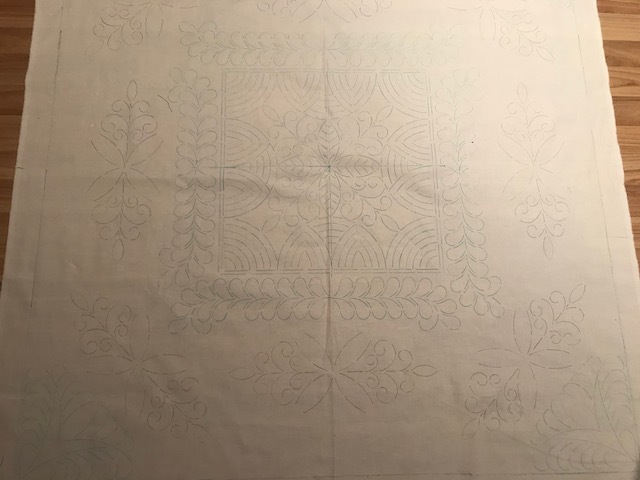 Use a crosshatch to fill in and it will look wonderful. Just MHO. Agree with P-BurgKay! Great start and looks completely doable! I would do micro stippling or small pebbles in the center area. I think a cross hatch will fight against your corner motifs in that area. Outside of that cross hatching would work well. Thanks to you three ... 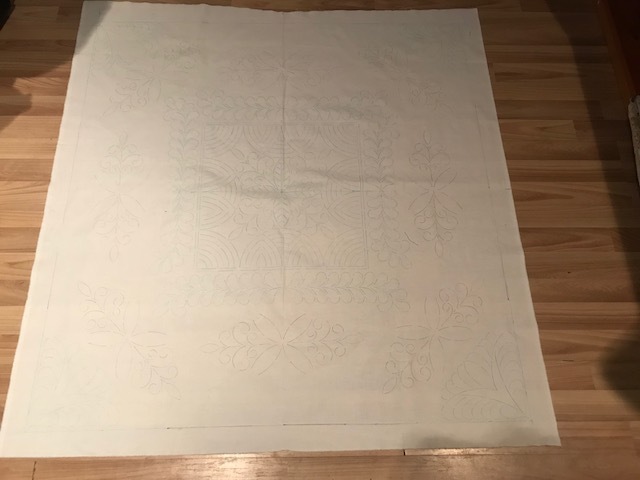 I need something that I can make a pattern of ... free hand FMQ is not my forte yet!!!! That will be stunning when finished! I would do a diagonal crosshatch in your empty spaces after you do an echo around your feathers etc. I would not add anything to your medallion area in the middle at least until you have finished some of your design, it looks like it will be perfect as it is. Great design! Makes me want to run to my machine and start quilting ;-) . I think the center is finished just the way it is. outside of it, I would echo your design & straight line from the medallion line to the border. Just a narrow distance of maybe 1/16". Look at some of Lisa Calle's stuff to see what I'm talking about. If you're using rulers, it's not hard to do, just time consuming. Rhonda K knows what kind of sewing machine I have, and helped me out with the micro stippling ... I like it! Your work is beautiful! 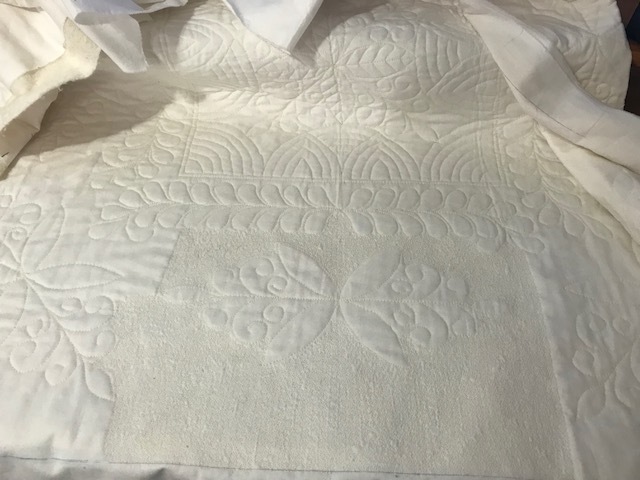 Whoever gets this one, you or anyone else, will have a fantastic quilt! Can somebody explain "micro-stippling" please? Caroline, it's when your stippling is super tiny and dense! The kind you can only do on a sewing machine! I can’t wait to see it finished...it’s going to be fabulous. You do such wonderful work. 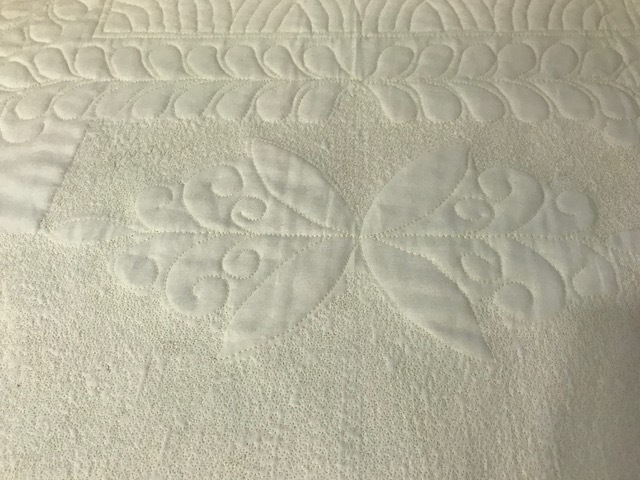 Your quilt is looking great. You're on the right track.